Temperance is defined as moderation or voluntary self-restraint. It is typically described in terms of what an individual voluntarily refrains from doing. This includes restraint from retaliation in the form of non-violence and forgiveness, restraint from arrogance in the form of humility and modesty, restraint from excesses such as splurging now in the form of prudence, and restraint from excessive anger or craving for something in the form of calmness and self-control. Temperance has been described as a virtue by religious thinkers, philosophers, and more recently, psychologists, particularly in the positive psychology movement. In classical iconography, the virtue is often depicted as a woman holding two vessels transferring water from one to another. It was one of the cardinal virtues in western thought found in Greek philosophy and Christianity, as well as eastern traditions such as Buddhism and Hinduism. Temperance is one of the six virtues in the positive psychology classification, included with wisdom, courage, humanity, justice, and transcendence. It is generally characterized as the control over excess, and expressed through characteristics such as chastity, modesty, humility, prudence, self-regulation, forgiveness and mercy; each of these involves restraining an excess of some impulse, such as sexual desire, vanity, or anger. Themes of temperance can be seen across cultures and time, as illustrated here. Temperance is an essential part of the Eightfold Path. The third and fifth of the five precepts (pañca-sila) reflect values of temperance: "misconduct concerning sense pleasures" and drunkenness are to be avoided. The concept of dama (Sanskrit: दम) in Hinduism is equivalent to temperance. It is sometimes written as damah (Sanskrit: दमः). The word dama, and Sanskrit derivative words based on it, connote the concepts of self-control and self-restraint. Brihadaranyaka Upanishad, in verse 5.2.3, states that three characteristics of a good, developed person are self-restraint (damah), compassion and love for all sentinent life (daya), and charity (daana). In Hinduism literature dedicated to yoga, self-restraint is expounded with the concept of yamas (Sanskrit: यम). According to ṣaṭsampad, self-restraint (dama) is one of the six cardinal virtues. The list of virtues that constitute a moral life evolve in vedas and upanishads. Over time, new virtues were conceptualized and added, some replaced, others merged. For example, Manusamhita initially listed ten virtues necessary for a human being to live a dharmic (moral) life: Dhriti (courage), Kshama (forgiveness), Dama (temperance), Asteya (Non-covetousness/Non-stealing), Saucha (purity), Indriyani-graha (control of senses), dhi (reflective prudence), vidya (wisdom), satyam (truthfulness), akrodha (free from anger). In later verses this list was reduced to five virtues by the same scholar, by merging and creating a more broader concept. The shorter list of virtues became: Ahimsa (Non-violence), Dama (temperance), Asteya (Non-covetousness/Non-stealing), Saucha (purity), Satyam (truthfulness). This trend of evolving concepts continue in classical Sanskrit literature, Dama with Ahimsa and few other virtues present in the evolving list of virtues necessary for a moral life (dharma). Five types of self-restraints are considered essential for a moral and ethical life in Hindu philosophy: one must refrain from any violence that causes injury to others, refrain from starting or propagating deceit and falsehood, refrain from theft of other's property, refrain from sexually cheating on one's partner, and refrain from avarice. The scope of self-restraint includes one's action, the words one speaks or writes, and in one's thoughts. The necessity for temperance is explained as preventing bad karma which sooner or later haunts and returns to the unrestrained. The theological need for self-restraint is also explained as reigning in the damaging effect of one's action on others, as hurting another is hurting oneself because all life is one. The Greek definition of temperance translates to “moderation in action, thought, or feeling; restraint." 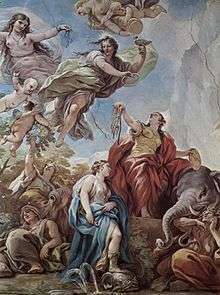 Temperance is a major Athenian virtue, as advocated by Plato; self-restraint (sôphrosune) is one of his four core virtues of the ideal city, and echoed by Aristotle. According to Aristotle, “temperance is a mean with regard to pleasures”. In “Charmides,” one of Plato’s early dialogues, the one who possessed ‘sophrosune’ is defined in four ways: (1) one who has quietness, (2) one who has modesty, (3) one who does his own business, and (4) one who knows himself. Plato quickly dismisses the three first definitions and argues against (4) that if ‘sophrosune’ would have been only the property of knowing what one knows or not, then it would be useless without knowledge about other matters. In the Judeo-Christian tradition, temperance is prolific. The Old Testament emphasizes temperance as a core virtue, as evidenced in both Solomon's Book of Proverbs and in the Ten Commandments, with its admonitions against adultery and covetousness. The New Testament does so as well, with forgiveness being central to theology and self-control being one of the Fruits of the Spirit. With regard to Christian theology, the word temperance is used by the King James Version in Galatians 5:23 for the Greek word ἐγκρατεία (enkrateia), which means self-control or discipline (Strong's Concordance, 1466). Thomas Aquinas promoted Plato's original virtues in addition to several others. Within the Christian church Temperance is a virtue akin to self-control. It is applied to all areas of life. It can especially be viewed in practice among sects like the Amish, Old Order Mennonites, and Conservative Mennonites. In the Christian religion, temperance is a virtue that moderates attraction and desire for pleasure and “provides balance in the use of created goods”. St. Thomas calls it a “disposition of the mind which binds the passions,”. Temperance is believed to combat the sin of gluttony. Temperance is commonly broken down into four main strengths: forgiveness, humility, prudence, and self-regulation. Values of temperance are still advocated by more modern sources such as the Boy Scouts, William Bennett, and Ben Franklin  Philosophy has contributed a number of lessons to the study of traits, particularly in its study of injunctions and its listing and organizing of virtues. Wikimedia Commons has media related to Temperance. ↑ Green, Joel (2011). Dictionary of scripture and ethics. Grand Rapids, Mich: Baker Academic. p. 769. ISBN 978-0-8010-3406-0. 1 2 Schwarzer, Ralf (2012). Personality, human development, and culture : international perspectives on psychological science. Hove: Psychology. pp. 127–129. ISBN 978-0-415-65080-9. ↑ Peterson, Christopher (2004). Character strengths and virtues a handbook and classification. Washington, DC New York: American Psychological Association Oxford University Press. ISBN 978-0-19-516701-6. ↑ Harvey, P. (1990). An introduction to Buddhism: Teaching, history and practices. Cambridge, England: Cambridge University Press. ↑ Brihadaranyaka Upanishad, Translator: S Madhavananda, page 816, For discussion: pages 814-821; Quote - "तदेतत्त्रयँ शिक्षेद् दमं दानं दयामिति", translation: Learn three cardinal virtues - temperance, charity and compassion for all life." ↑ Gupta, B. (2006). BHAGAVAD GĪTĀ AS DUTY AND VIRTUE ETHICS. Journal of Religious Ethics, 34(3), 373-395. ↑ Bailey, G. (1983). Puranic notes: reflections on the myth of sukesin. South Asia: Journal of South Asian Studies, 6(2), 46-61. 1 2 3 Niemiec, R. M. (2013). VIA character strengths: Research and practice (The first 10 years). In H. H. Knoop & A. Delle Fave (Eds. ), Well-being and cultures: Perspectives on positive psychology (pp. 11-30). New York: Springer. ↑ Peterson & Seligman 2004, M.E.P. (2004). Character strengths and virtues: A handbook and classification. Washington, DC: American Psychological Association.